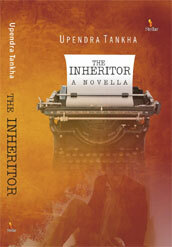 This slim book, call it a novella or a long story or whatyouwill, is out at the right time. These days the metroman with many gadgets and unlimited choices,is not at home with large tomes troubled as he is with a remote in his head. The Inheritor is all about the travails and peccadilloes of an out-of-job hack who shacks up with his parents and lives off his friends and wits in equal measure. The tale unravels the time when media jobs are far and few and the going for a free lance is knotty. The quirky satire moves from the bleak to the not-so-bleak. There ironic and humorous take moves on a subtle plane, unlike the airy and brash goings on in Upendra Tankha's earlier hilarious romp, first novel, A Bachelor Boy, also a STELLAR imprint. Upendra Tankha hails from the valley town of Dehradun, where his Kashmiri forbears landed in 1850. He studied at The Doon School, where his only sporting distinction was a spell of bowling against a rival house in a juniors’ cricket match. Later, he got to sow his wild oats at Allahabad University. He has worked as copyeditor for National Herald, The Financial Express, and The Economic Times, but never been accused of mucking up a copy, and believes while writing is a lark, editing is a knottier proposition. He also made a mark as film critic for nearly three decades for several publications, notably The Statesman, and hugely enjoyed sitting through film festivals simply because he was paid to do so. He buys many more books than he manages to read. But when someone switches a TV on, he retires to the study and nestles with a tome. He lives in the Capital with his family.